Making memories through beautiful canvas prints! Put Massive Monster Mayhem on your holiday toy list! Bleeping Motherhood Loves KLEE NATURALS MAKEUP! KinderPerfect: The perfect accompaniment to my glass of wine. And beer. And vodka. And mom friends. Okay, and cheese. Top 5: 4 Truths & 1 Lie Would You Rathers! What Is About The Worst Other Moment In Life? Get FREE useless Mommy Tips, directly to your inbox. You're Welcome. Click the mommy blog seals below to help our blog rating! Thanks! 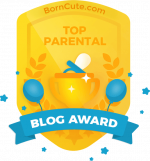 We’re awarded one of the Top Parental Blogs of 2017!